Quite recently, I've been obsessively fascinated with New York City. It's gotten to the point that I've been watching the new live stream out of the Statue of Liberty and angsting about being able to go back one day. 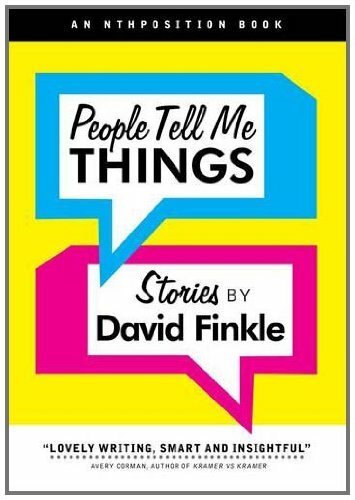 Needless to say, I jumped at the chance to read David Finkle's new book People Tell Me Things, short stories about people's daily adventures in New York. Unfortunately, my excitement was soon lost. The stories are all told about 'the in crowd' people: artists, writers, musicians, etc - basically, everyone who is better, richer, and more interesting than you. The stories mainly consisted of what I call First World Problems: affairs, lovers, and cheating are abound! Not everything put our American society in a good light. Each individual story is meant to have a different narrator, yet I didn't not realize this until much later. I thought the narrator was David Finkle himself in all ten stories. Sometimes the stories flowed oddly, and I thought a new chapter was just a continuation of the last chapter. I skimmed the last bits of the book, guilty as charged. I was also a bit disappointed that I wasn't completely immersed in Manhattan, as I thought I would be. Except for brief mentions of locations (Madison Square Garden, MoMA), this book could've taken place in any city! Granted, Finkle does do a good job at examining the humanistic side of each scenario/story. The stories are not purely for humor, shock, or just to tell. Each person is almost viewed psychoanalytically. Other stories had interesting aspects, such as Rembrandt Paints Again - anything having to do with Rembrandt is okay with me! So maybe this book didn't completely fly with me, but don't simply take my word for it! TLC Book Tours is gracious enough to offer up a copy of the book to one of you readers! Form your own opinions and enter to win here. I'm sorry this one didn't turn out to be what you'd hoped, but thanks for sharing your thoughts for the tour.